This luxury Christmas fruit cake is an ideal gift to give it your friends and family this Christmas. This handmade novelty Christmas cake is made fresh to order with natural ingredients and top quality fruits covered with Fondant icing, marzipan all handcrafted, hand decorated and delivered direct to your doorstep so you recieve the best taste and maximum shelf life if you can resist to keep it. This Christmas fruit cake is suitable for vegetarians as its Alcohol free. All our celebration and Christmas cakes are wonderful gift ideas for your family and friends, a fantastic way to treat your staff and wonderful words of appreciations to your customers. So why send flowers this Christmas send Christmas cake instead! 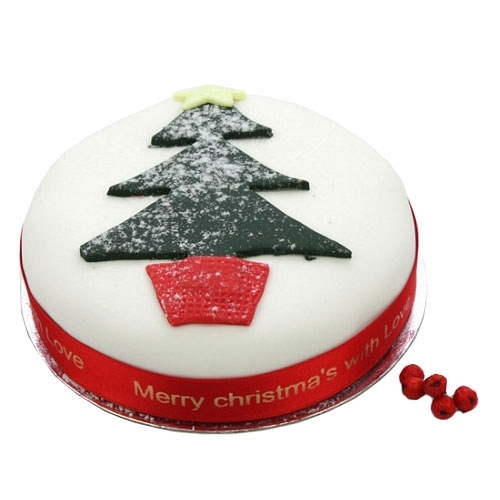 Corporate Christmas cake: we can deliver personalised christmas cake for your colleagues and customers UK wide with your company's logo on the icing and personalised ribbons with free message card. Delivery is available from Monday - Saturday so just speak to us or email us with your requirements and leave the rest for us to arrange it for you. Sultanas, Currants, Wheat flour, Sugar, Cherries, Whole egg, Vegetable fats, Mixed peel, Maize starch, whey powder, Raising agent, Natural colour flavours and preservatives. Nuts Allergy Information: All our cakes are hand crafted by our professional bakers in an environment with traces of Nuts. similarly we buy our flour and ingredients from suppliers deals with nuts.